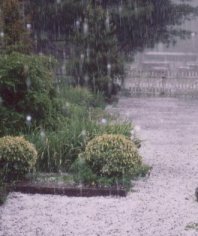 A very common question we are asked is can solar panels withstand hail? This is a very important question as solar panels mounted on your roof are right in the line of fire of hail, so here is the answer. Quality solar panels are made from tempered glass just like the windscreen of your car. Tempered glass, also known as safety glass or toughened glass, is anything up to six times the strength of normal plate glass. It is created by thermal or chemical means and is tested to withstand the impact of normal hailstones and snow loads on the panels (not that snow is a real issue here on the Gold Coast!) When tempered glass does break, it shatters into small pieces rather than into large, razor sharp shards as standard plate glass does. Solar Panels and hail, what about HUGE hail?! Obviously there is a limit to what you would call a “normal hailstone”, and occasionally hail storms come through with extremely large hail stones. In these cases there is a good (or should I say bad) chance that some solar panels may be smashed as in the following picture, just like there is a chance that large hail will smash the windscreen of your car if you are unfortunate enough to be caught in it. To mitigate this risk as much as possible after you have had a solar power system installed on your roof we highly recommend letting your home and contents insurance provider know about it so that the solar panels can be noted on your policy. Insurance companies have a habit of trying to avoid paying out money on claims and if you haven’t t let them know about the system there is a chance that they may try and slip out of paying for a replacement solar panel. Standard plate glass can still be found on some cheaper brands of mono-crystalline and poly-crystalline solar panels made by small, unknown companies and on most brands of amorphous (thin film) solar panels, they can try and make it stronger by using thicker plate glass, but it is still nowhere near as strong as tempered glass. Also with plate glass it can cloud over time, which would greatly reduce the solar panels power output. 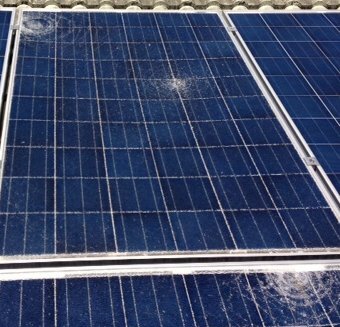 These solar panels and hail do not mix well. So in conclusion you do get what you pay for and it is important to let your insurance company know about your solar panels. When buying solar panels it should be clearly stated on the product specifications the type of glass used, if it is not, it is highly likely to be plate glass. Quality solar panels are made from tempered glass and designed to withstand hail, don’t be deceived with unknown brand solar panels at prices to good to be true, as the saying goes if it seems too good to be true it probably is! Mono Crystalline or Poly / Multi Crystalline – Does it Matter?